Low Inventory - Only 2 In Stock, Will Ship On: 04/23/2019. Making your own wine is satisfying and easy. As long as you ferment great juice, keep everything sanitary, and give it enough time to age (3 months or more for whites, 6 months or more for reds), you will get great wine. 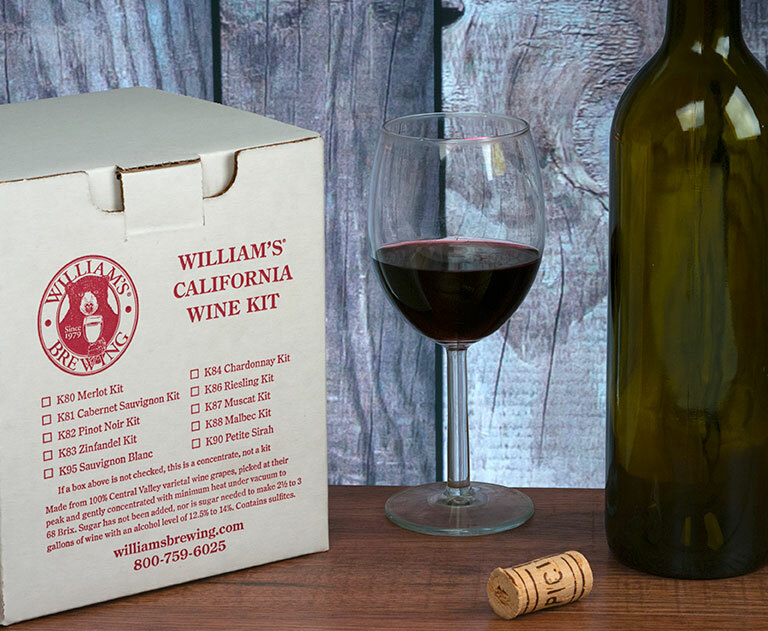 Here at William’s, we have developed our William’s California Wine Kits with this philosophy in mind. Our Kits include 96 ounces of pure California varietal grape concentrate, condensed at temperatures that never exceed 180 degrees F. from Central Valley wine grapes picked at their ripe peak in the late Summer and early Fall. To complement the varietal juice, specially selected dry wine yeast, oak chips, and nutrient are also included as needed. Unlike many wine kits featuring added sugar, this 96 ounces of pure concentrate is all that is needed (except for the yeast and addtives) to produce 2.5 gallons (12 bottles) of varietal wine. The Malbec grape is a relative newcomer to California, and the Malbec grapes for this kit are grown in Lodi. Our California Malbec has a rich body, subtle spiciness, and full flavor. Best of all, its forgiving nature means it can taste good even 3 months after it is bottled. This shows our Malbec after 4 months in the bottle. This product has just finished fermenting out and has been racked off and now is in the settling process. It appears like it is going to be a very good wine. It racked out at about 13 percent alcohol, which I was very pleased with. This was my first attempt at winemaking. Very simple with good instructions. Finished with a higher-than-expected FG, but I might have racked it off the yeast too soon. Would try this kit again.